What is a Central Library? A Central Library functions as the hub or core of the public library system within a city, region, or municipality. It is usually the largest of all the libraries in the library system and houses the most comprehensive collections as well as special collections relevant to the community it serves. The Central Library is generally located within the downtown core and is an architecturally distinguished building that often becomes an easily identified municipal icon. A Central Library serves as a resource and provides a supportive role to the other branch libraries. Its large general and specialized collections enhance the resources of the branches so that people using any branch have access to more comprehensive and special resources, books, media, and staff expertise. Halifax Central Library was designed to be a regional resource, an active information place, and a reflection of the communities within Halifax. The Central Library was made to enhance Halifax Public Libraries’ ability to design and redesign services, and to reach out to and attract more people. Services were planned to be flexible, based on the needs of the community, and utilize the best that technology had to offer. An asset to the branch libraries in supporting their collections, service development, and programming. 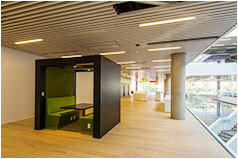 Halifax Central Library was envisioned to blend the best of traditional library services with new and innovative spaces, making it a "vital centre for learning and culture in the heart of the community". The proposed Central Library needed to replace the aging Spring Garden Road Memorial Public Library, which was rapidly deteriorating and no longer able to deliver service efficiently and effectively. As a civic landmark, Central Library was assigned the role of being a source of pride and inspiration for all residents and a welcome addition to the streetscape. Within the last decade there has been a resurgence of Central Library construction worldwide as a key ingredient of successful and livable cities. The cities of Vancouver, Montreal, Winnipeg, Phoenix, Seattle, Amsterdam, and Hong Kong are a few examples. A civic landmark and a source of pride and inspiration for all residents. A centrepiece of the Capital District, contributing to the economic revitalization of the downtown and sparking cultural and learning activities. An accessible, bright, and welcoming destination for adults, youth, families, and newcomers providing opportunities for civic and social interaction as well as quiet individual use. An environmentally friendly, sustainable building. A rich resource centre for knowledge, learning, and personal growth. An asset to the branch libraries by providing resources which assist them in being more responsive to local community needs. An adaptable and flexible space that will be able to meet the changing needs of users and accommodate new innovative technologies and new demands.